With its forebodingly evocative visuals, grim tone, and ugly view of the depraved, unforgiving American frontier, The Missing barely resembles a Ron Howard film—which is probably why it’s one of the director’s finer efforts. Adapting Thomas Eidson’s novel The Last Ride, Howard and ace cinematographer Salvatore Totino present a late-19th-century New Mexico as an alternately beautiful and barren nightmare landscape, one marked by unholy darkness, supernatural forces, and desolate cruelty. The Missing tells the story of a woman who endeavors to rescue her kidnapped child (Evan Rachel Wood) from a gang of Native Americans who formerly worked for the U.S. Army, and are now led by a malevolent witch intent on selling the captives into slavery in Mexico. It’s a Western in which years of contentious cohabitation between American and Native American cultures has spawned only twisted emotions and perverse identities, and has left everyone on both sides of this cultural divide hopelessly scarred. In her quest to reclaim her child, single mother Maggie (Cate Blanchett) is compelled to team with her father, Samuel (Tommy Lee Jones), who skipped out on their family in order to live among the Native Americans, and who agrees to this mission in order to make amends for his prior desertion. Issues of abandonment run rampant throughout The Missing, and though redemption is sought by many, Howard’s film consistently takes a somber, cynical view of such hopeful notions, so mired is it in the internal and external suffering of its many characters, including Maggie’s younger daughter, Dot (Jenna Boyd), who must tag along with her mother and grandfather on their quest. While the story’s more mystical elements sometimes result in hokiness, the overarching portrait is one of people, and a nation, warped beyond repair by the violence they inflict on others and that which is inflicted upon them. 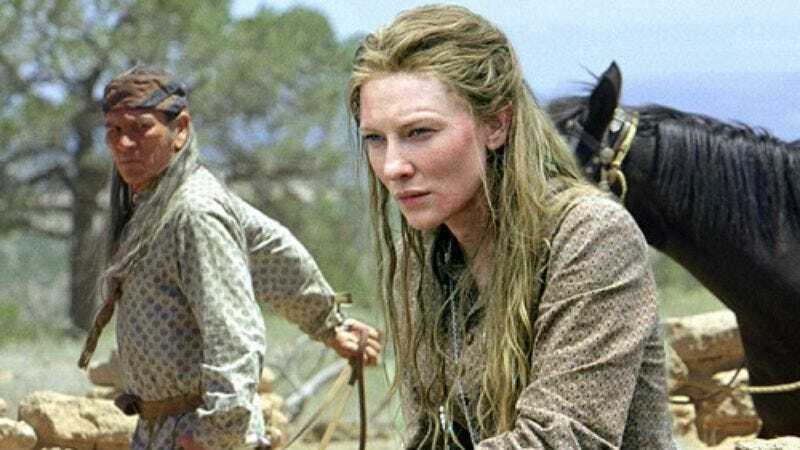 And in Blanchett’s rugged, nuanced embodiment of maternal devotion and resolve, the film serves as a uniquely nasty revisionist counterpart to its most hallowed spiritual predecessor, John Ford’s The Searchers. Availability: The Missing is available on Blu-ray and DVD through Netflix, Amazon, and possibly your local video store/library. It’s also currently streaming on Netflix and can be rented or purchased through the major digital services.